Our SEM is very versatile due to its size and features. We can easily fit objects up to 8 inches in diameter and 3 inches tall but depending on the geometry of the object we may not be limited to those dimensions. Another very useful feature is our ability to operate at low chamber vacuum allowing us to view non-conductive or organic materials without sputter coating them. 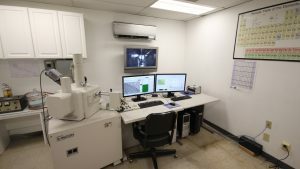 QUANTAX 200 is a modular EDS system for qualitative and quantitative microanalysis in industry, research and education. 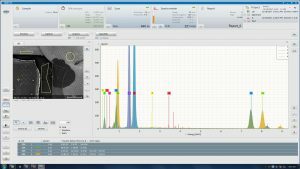 The system’s standard-less quantification software enables manual, automatic or interactive spectra evaluation and provides reliable results for specimens with polished or irregular surfaces, thin layers and particles. An outstanding advantage of the system is the incorporated sixth generation XFlash® detector – a Silicon Drift Detector which needs no LN2 cooling, provides extremely high throughput rates and improved light element detection capabilities. 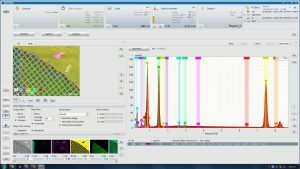 QUANTAX 200 features a powerful scanning system as well as line scan with PTS functionality and mapping for brilliant element images. We can operate from 15x to 150,000x and generate quantitative graphs of the elemental composition of almost anything.